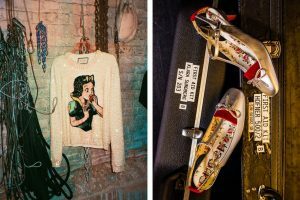 The sister duo behind First Aid Kit talk heartbreak, fashion must-haves, and on-the-go beauty secrets. 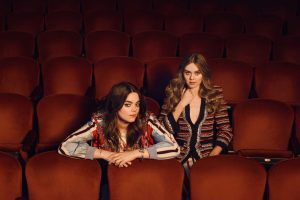 Songstress sisters Johanna and Klara Söderberg of Swedish folk band, First Aid Kit, are having a moment. 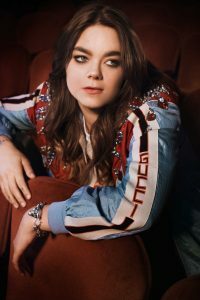 The burgeoning duo released their new hit album, “Ruins,” earlier this year and recently performed at the historic Beacon Theatre in New York City. 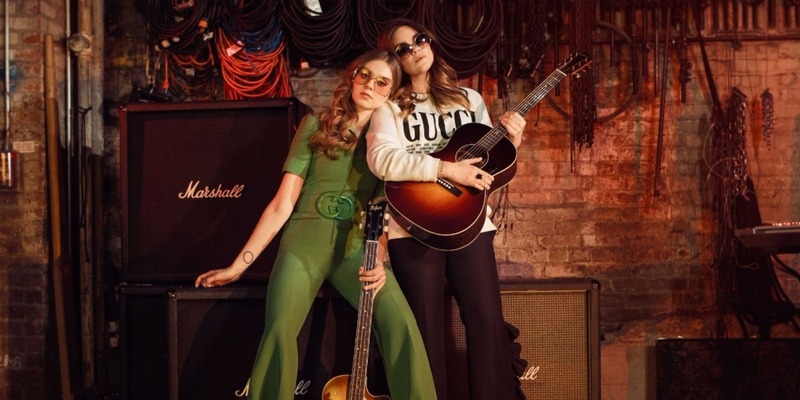 Recognized not only for their original lyrics and perfect harmonies, the band’s stylish music videos and stage presence are also inspiring the fashion set, with Gucci taking notice. What sets this album apart from your previous music? This is a break up album. It’s quite dark and melancholic. It’s more personal than our previous albums. Because of the lyrical content, we wanted to make this record a little rough and raw. It’s not perfect, but it feels very honest and heartfelt. We tried to achieve a live-feeling to the sound. We recorded with this incredible big session band all together in the same room. It was a very spontaneous and fun process. The inspirations for the album came from so many different places. New discoveries like the band Big Thief, Angel Olsen, and Kevin Morby. But also, old time classics like Fleetwood Mac, Heart, and Gram Parsons. What journey do you hope the listeners will take? We just hope the listener can relate to the songs and really take them in. For us writing these songs was very therapeutic, hopefully it feels the same way for the listener. Maybe when listening to “Ruins” they can feel less lonely and more connected to the world. We’re all in this together, we’ve all been through heartbreak in one way or another. We’ll get through it. You just performed at the Beacon Theatre—what does this mean to you?Performing at the Beacon was such a huge honor. We’d never been there before and were stunned by the beauty of the building. We got goosebumps standing on stage looking out at all the gorgeous scenery. It has such a regal and majestic vibe. The fact that so many of our musical heroes have played there before definitely influenced our performance. You can feel it in the air. It was an unforgettable evening. How does your music influence your style and vice versa? 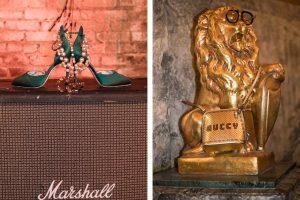 We are huge fashion fans, but the music always comes first. We want to look the way we sound; it all has to go together. We literally wear our influences on our sleeves. Whether it’s a nudie inspired suit à la Gram Parsons or a fringe dress like one worn by Emmylou Harris. We’ve always loved the music of the ‘60s and ‘70s. That whole era was so interesting in fashion too, so revolutionary and creative. 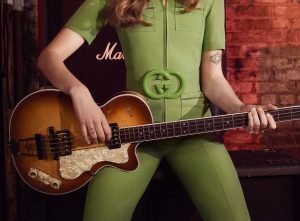 Favorite Gucci pieces from the shoot? We loved everything from the shoot. It was such a dream to get to wear these pieces. 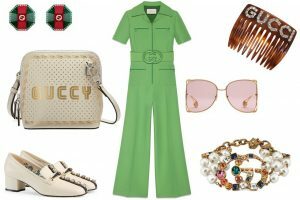 Our favorite out of all them has to be the green jumpsuit. Because it fit like a glove and has the perfect ‘70s retro vibe. We also fell in love with those sequined shoes as well. They are so dainty and cute, but badass at the same time. Our style has changed a lot over the years. When we started out we both had short hair and a very unisex look. We wore flannel shirts, jeans, and boots. It was very basic. A few years later we started wearing a lot of long floral bohemian vintage dresses. With “Ruins” we wanted to add a little bit more ‘70s glam rock to our style. It’s a little darker and edgier, going with the sound of the record. These days our private style is more minimalist and functional. It’s nice to have that contrast between being on and off-stage. Putting on a stage outfit should be like a ritual, like entering a new world. How has Stockholm influenced your aesthetic? It’s definitely very inspiring to live in Stockholm. People do have some amazing style here, even though it can be really difficult to know how to dress in the freezing cold! Lately we’ve seen a lot of Swedes move away from that minimalistic monochromatic look, instead trying more bolder colors and patterns. It’s refreshing. Current fashion obsessions? Go-to uniforms? 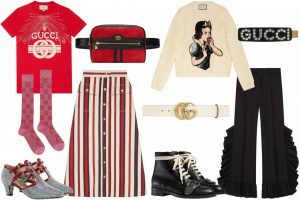 Our go-to uniforms at-the-moment must be either straight leg jeans, vintage t-shirts, and plaid blazer OR oversized colorful jumper over a midi length skirt or dress. Always worn with cowboy boots. When touring, what skincare routine do you follow and what are your makeup must-haves? Since we fly a lot, moisturizing is key. We love sheet masks and wear them on long flights, we probably look ridiculous, haha. We try to use organic products whenever possible. It feels nice to use something that looks great that is also good or the skin, instead of using chemical products. In celebration of Kate Spade New York’s 25th anniversary.